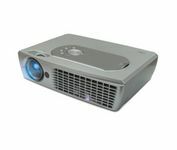 The CX6 DLP Multimedia Projector combines a brilliant 2000 lumens brightness with a high 2000:1 contrast ratio, producing a digital projector that will satisfy the most strenuous business presentation needs, as well as those of the most discerning video buffs. DVI, Component Video, and S-Video connections with automatic deinterlacing and built-in progressive scanning provide smooth and realistic HD images that pop off the screen. Convenient features such as VGA monitor pass-through, mouse control via infrared remote, and a handy carrying case make presentations a breeze as well.